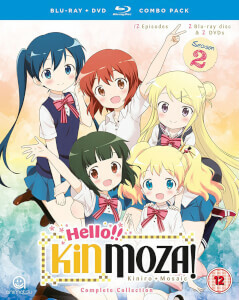 **Special Edition Combo Pack with Limited edition O-Card Cover** This Kinmoza! collection contains episodes 1-12 across 1 Blu-ray disc and 2 bonus DVD discs. Shinobu Oomiya once left Japan to participate in a homestay in England. During her time there, she became close friends with Alice Cartelet, the daughter of the family she was living with. However, when it was time for Shinobu to return to Japan, the two were able to express their sorrow despite the language barrier between them. Five years later, now a first year student in high school, Shinobu receives a letter by air mail in a language she does not understand. This letter is penned by none other than Alice, detailing her own homestay in Japan. In fact, Alice will be attending Shinobu's high school and living with her! Alongside their friends Youko Inokuma, Aya Komichi, and Karen Kujou, the five girls attend school together and learn about what their different cultures have to offer, day after day. Spoken Languages: Japanese, English subtitles.